Very few people know that in Kovel (Volyn Oblast) there is a public orthopedic workshop where you can get a FREE prosthesis. “There is German equipment and personnel trained by German professors. This workshop is affiliated with the – Lviv branch for prosthetics of the Ministry of Labour and Social Policy of Ukraine, “Ukrprotez,” and the Lviv State Experimental Company which focuses on vehicles and prosthetics. The company serves people with disabilities in Volyn, Zakarpattia, Ivano-Frankivsk, Lviv and Rivne regions. A shop located in Kovel, specializes in orthopedic products with orthocoverings. 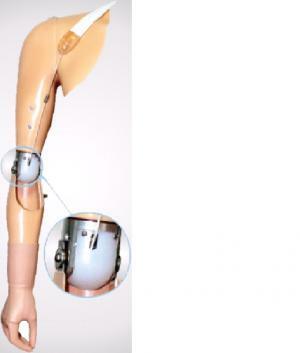 This is the latest technology for manufacturing artificial limbs and yet is the only one in Ukraine. Because the company has a medical department that deals with prosthetics, people with disabilities can obtain the necessary prosthetic upper or lower limbs and shoes for foot deformities. A well-trained medical staff help them do so, provide expert advice, take measurements and provide psychological support. And people go here for prosthetics from all over Ukraine. This high-technology! The prosthetics are not heavier than healthy hands and feet … the prosthetics and consultations are free, and the prosthetics are hi-tech. “Kovel orthopedic prosthetics workshop produces upper and lower limbs with new technology in Ukraine for FREE for the disabled!! !” – writes journalist Natalia Shepel. This entry was posted in English, English News, Help for ukrainian wounded, Pictures, War in Donbas and tagged #RussiaInvadedUkraine, #UkraneUnderAttack, Kovel orthopedic prosthetics workshop, Lviv State Experimental Company, prostheses, Ukraine. Bookmark the permalink. Thank you best Ukraine people. Glory to Ukraine! !